The wooden board in these photos was made by my friend Rosie Brewer, whose beautiful designs are made out of wood sourced from Devon forests. 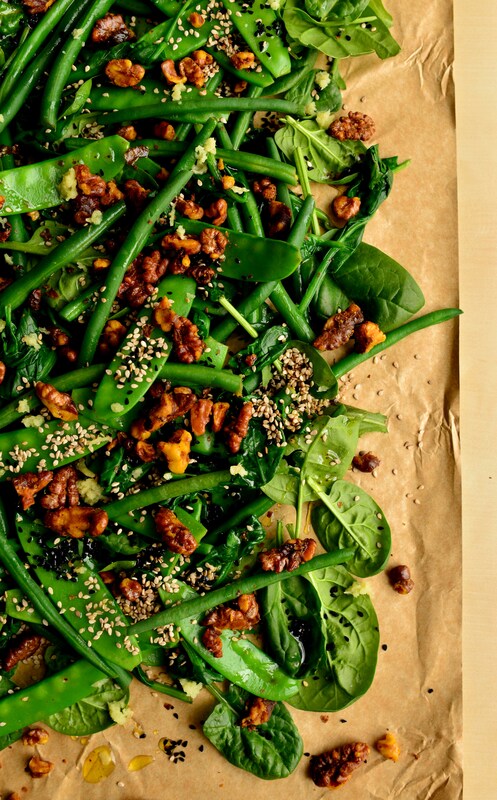 So, I wanted to make a simple salad to style on the board that wouldn’t take away from its natural beauty. Due to an excess of figs, a somewhat middle class crisis, I chose to make them the focal point. I also have a certain affection for the combination of figs and cheese, so chose to add some Comté, one of my favourite cheeses. French, and made from unpasturised cow’s milk, Comté has a pleasant nutty taste, that went well with figs. I tend to randomly throw things together when making salads, and have a fondness for combining fruit, cheese, nuts and a punchy dressing. But my primary consideration when making this salad was that the colours would work well on the board – I added thin slices of pink radishes purely for artistic reasons, as I don’t actually like them that much. Have a browse of Rosie’s Etsy shop here. Paris and I are back in the kitchen together. This can only mean two things. Beetroot and kale. 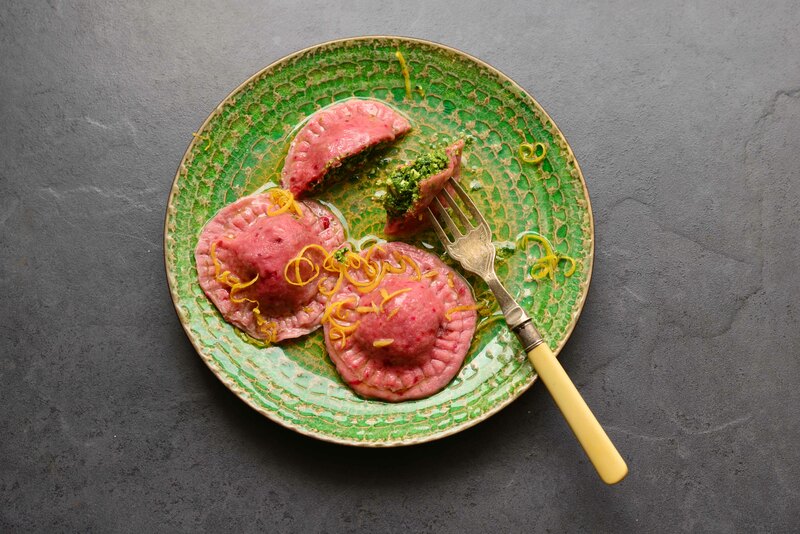 So here you have it: handmade pasta tinged pink with beetroot juice, stuffed with kale pesto. 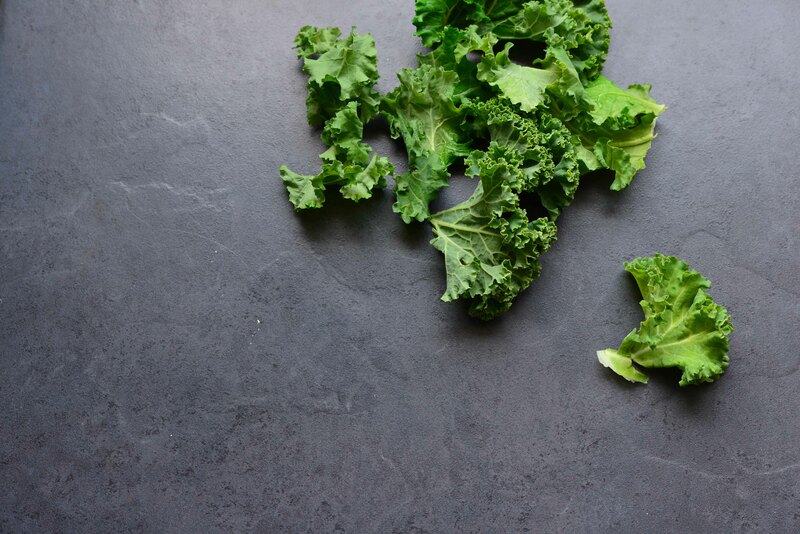 Kale pesto – hipster, much? But we’re going to embrace it. This is one of the more time-consuming and intricate of mine and Paris’ culinary meanderings, but we’re more grown up now. 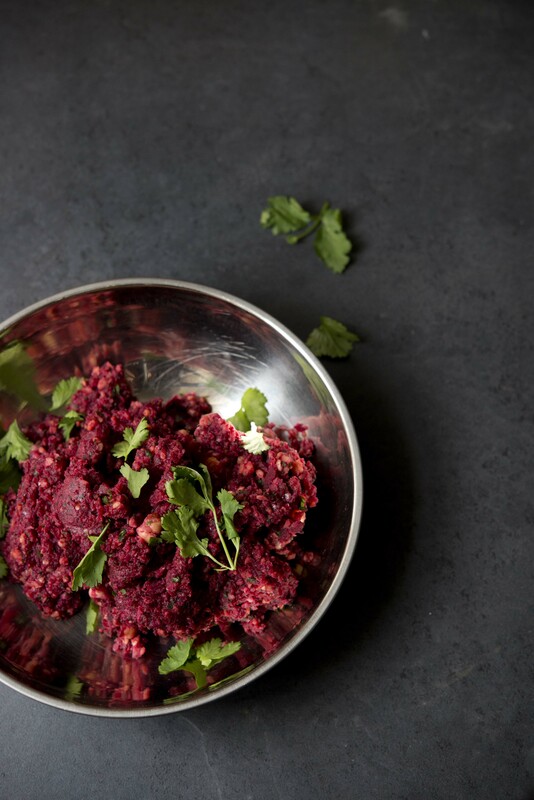 We’ve been ‘collaborating’ for over a year now – all the way back to that Quinoa Porridge with, you guessed it, beetroot. 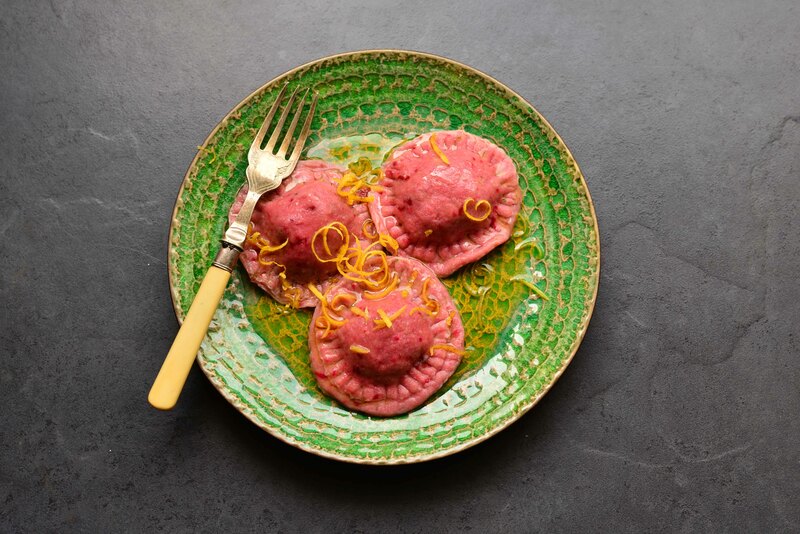 Therefore, we thought it was high time we pushed the boat out and did something that could definitely be called a recipe, and not just a random selection of ingredients we cobbled together (which usually involved beetroot and/or kale…). Having ‘worked’ together pretty often now, we have got better at anticipating what each other is thinking when we create the recipe, and seeing in a similar way when we style the shots. I was pretty sure we had an almost identical picture of what the finished shot would look like before I took a single picture. And having another pair of eyes when setting up the shots always helps, as they invariably see new ways of viewing the subject that you’d not considered. 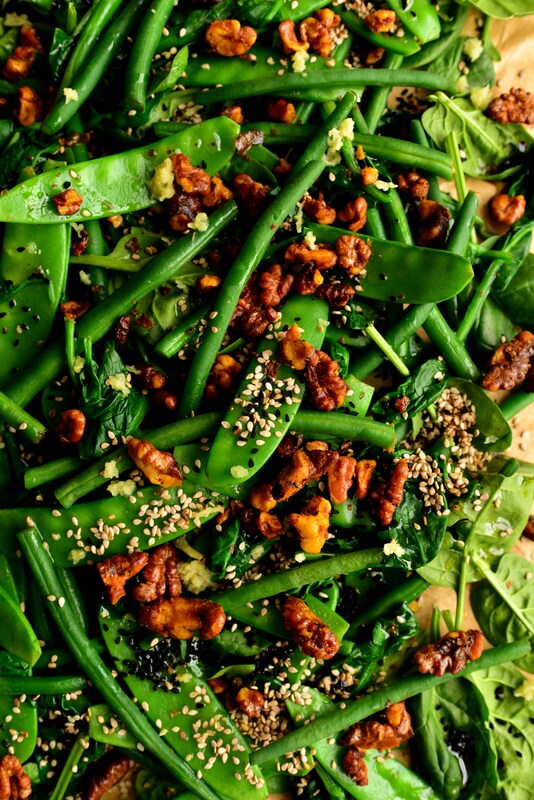 This salad is an unashamed plagiarism from a recently acquired cookbook, ‘Persiana’ by Sabrina Ghayour. Packed full of mouth-watering photos of exotic dishes, it’s a firm favourite. Many recipes feature ingredients that I already (somewhat smugly) own, such as sumac. The book is littered with recipes that I have already made more than once, which is rare – I consider a cookbook a success if I make one recipe from it. I am normally somewhat underwhelmed by rice salads, and almost flicked straight past this one when browsing through the book. However, given that I have a nearly empty box of red rice lurking at the back of my cupboard, I decided to give it a go. It’s safe to say that I needed to seriously reevaluate my view on the matter after making this salad. The balance of sweet and salty is just right, and the colours and textures compliment each other beautifully. 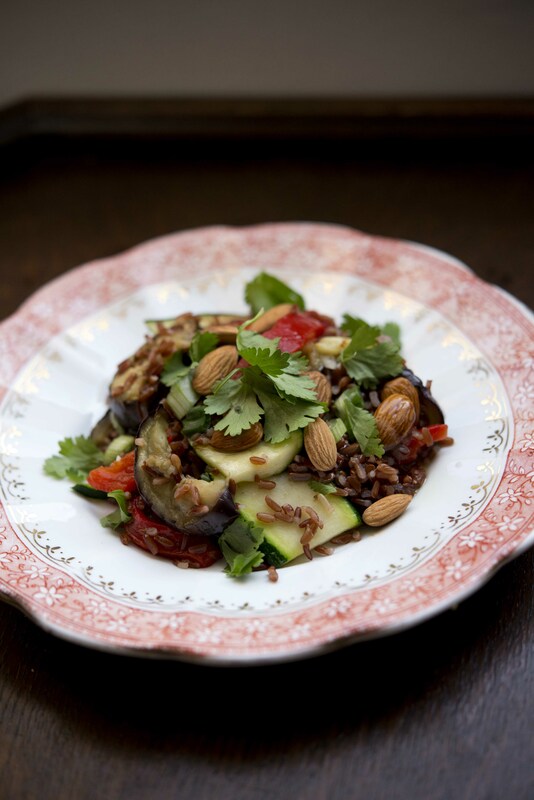 There is also a pleasing balance of warm and cold ingredients – chargrilled vegetables and toasted nuts with cold rice and onions – which works well. Owning more than one type of rice may sound extravagant (at last count I have 3), but red rice is definitely worth tracking down for this recipe. 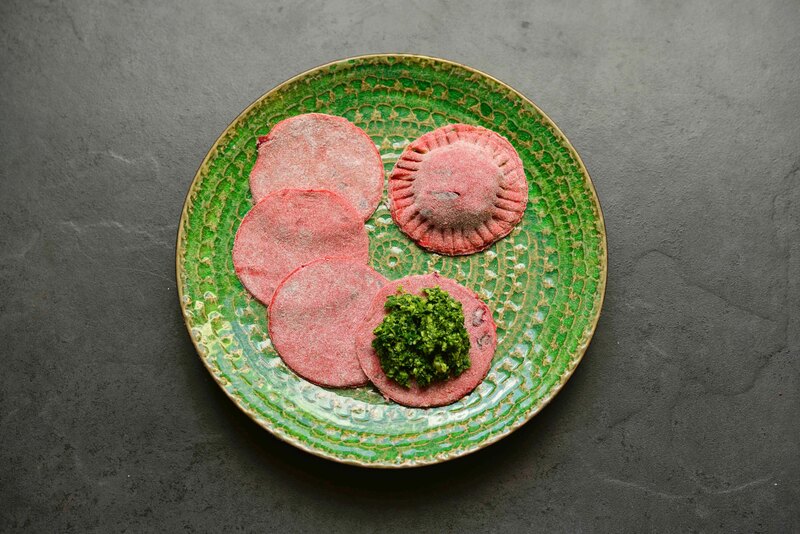 It has a pleasant nutty taste, and retains its attractive maroon colour, even when cooked. It does take a rather long time to cook though, which I always forget, and am left tapping my fork impatiently against the side of the pan, willing it to cook faster. You shouldn’t have too much trouble finding it, as Sainsbury’s stocks it, proving once and for all that they’re paying attention to the latest hipster food trends. Red rice is staying firmly on my (somewhat hipster) shopping list from now on. This recipe was written by my friend Clare, a chef. She’s an amazingly creative cook, and a fan of putting (non-toxic, as she always reminds me) glitter on top of everything from cakes to roast dinners. I remember a particularly surreal occasion involving rice noodles topped with silver glitter. Clare’s got an incredible gift for making a meal look like a work of art, meaning that the dishes she whips up usually look too pretty (not to mention too covered in glitter) to be edible. 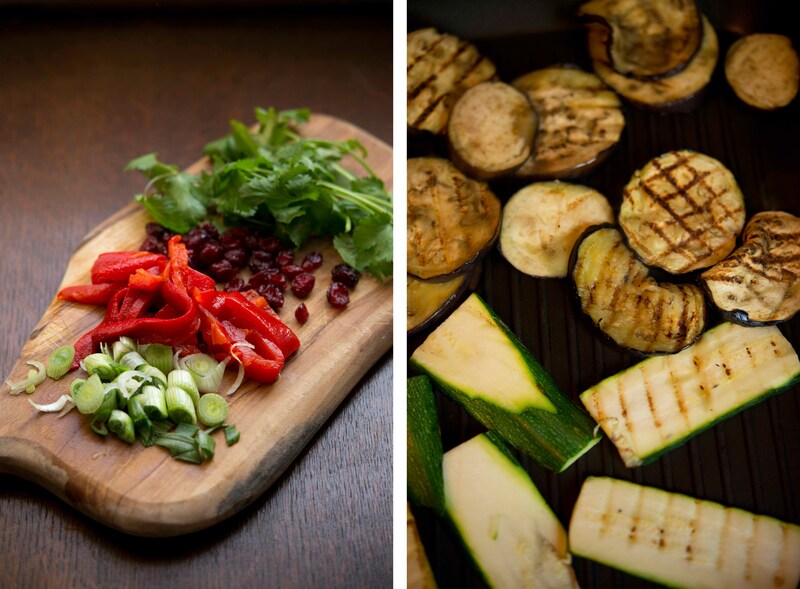 Clare wrote this recipe as a guest contribution to Ohana magazine, and asked me to take the photos. 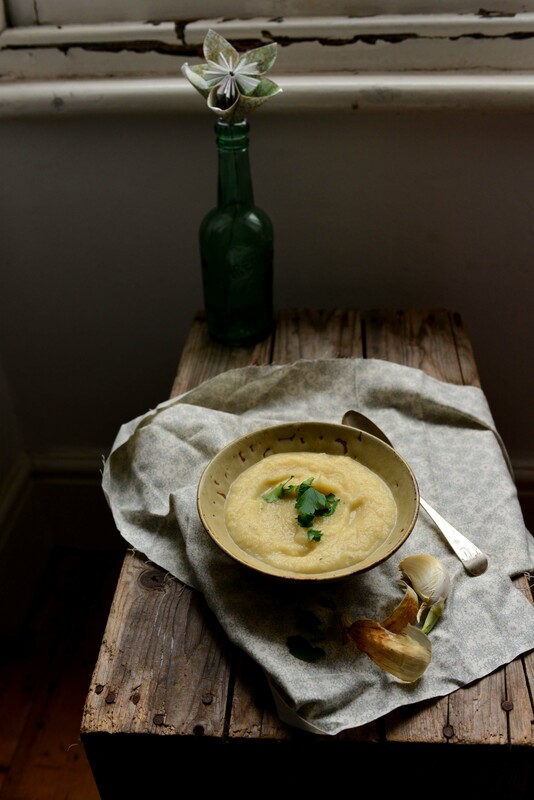 We cooked this recipe back on dreary, dark February evening. 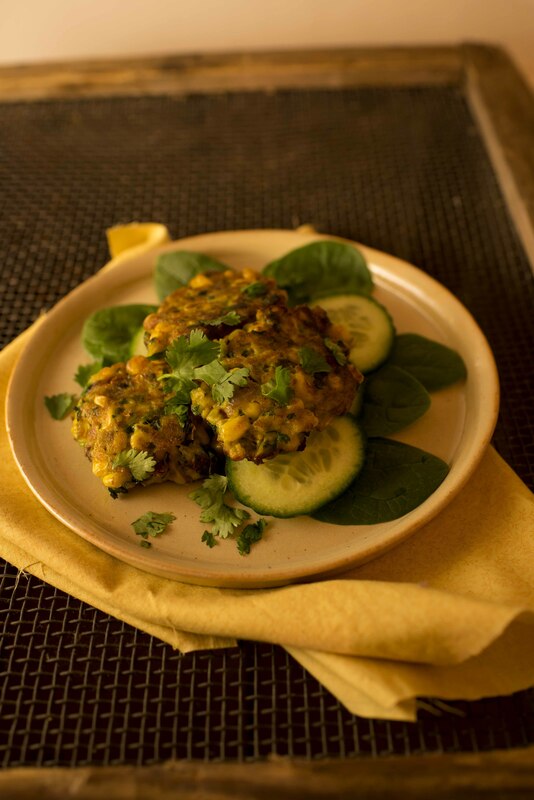 Ironic, considering Clare’s titled this recipe ‘Sunshine Sweetcorn Patties’. To make this recipe, Clare bought over her entire spice cabinet, and set about decanting pretty much the whole lot into the fritter batter. 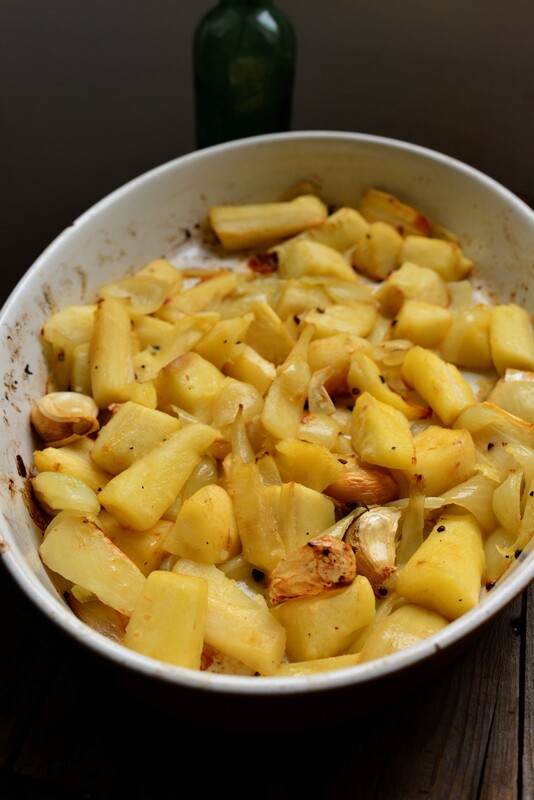 This is a relatively simple recipe, but one that is so much greater than the sum of its parts. 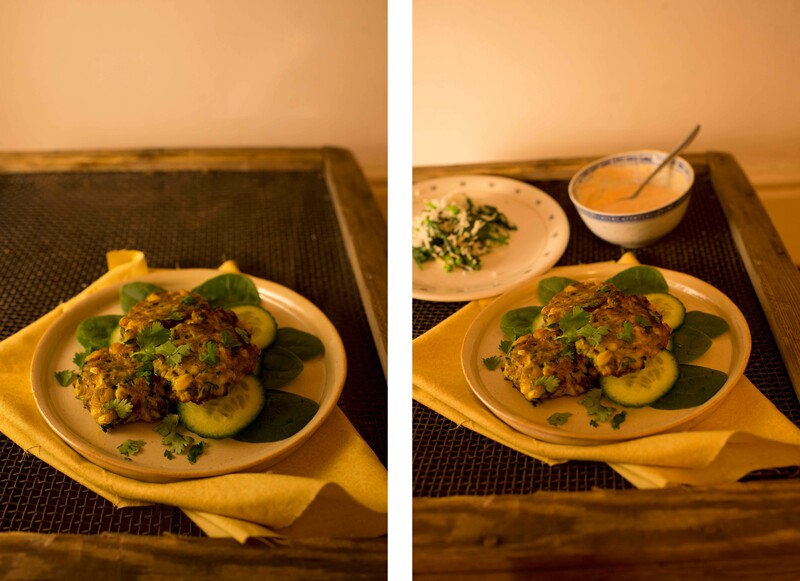 Whilst Clare fried the fritters, I fussed about ‘styling’ the shot: arranging pieces of fabric on top of a wooden box and going through numerous plate options. I eventually settled on a neutral, sand-coloured plate to compliment the yellow of the sweetcorn. I have had a few (unsuccessful) forays into artificial lighting before, but as I had no other option on this occasion I had to give it another go. Sunlight is naturally more flattering to food than any other type of light, in my opinion. High-end food photography for big brands is usually done with carefully controlled artificial light in a studio, but I prefer the more authentic touch that natural light gives. My ‘set up’ for this shot involved dragging a wooden box to the middle of my bedroom floor and angling a desk lamp at it. Most of the problem with artificial light seems to be the high contrast and harsh shadows that using a single directional light source creates, so I counteracted this by placing a diffuser between the lamp and the food. This helped a little, but there was still some white balance adjustment needed in post-production to get the colours to look less washed out. The finished result is ok, but will never compare to the magic quality of natural light. This is an embarrassingly unoriginal Ottolenghi knock off. I even shamelessly copied the style of the photographs. The recipe is an amalgamation of two different offerings from Yotam’s latest cookbook, ‘Plenty More’. Apart from the dressing, which we cobbled together from random ingredients lurking at the back of the kitchen cupboard, it’s pretty much a dead copy. Which is unusual, as I don’t find myself following recipes much these days. I get too frustrated with following exact measurements and prescriptive methods, and end up disregarding both and producing something that bares little resemblance to the intended dish. One of the hazards of being a food blogger, I guess. 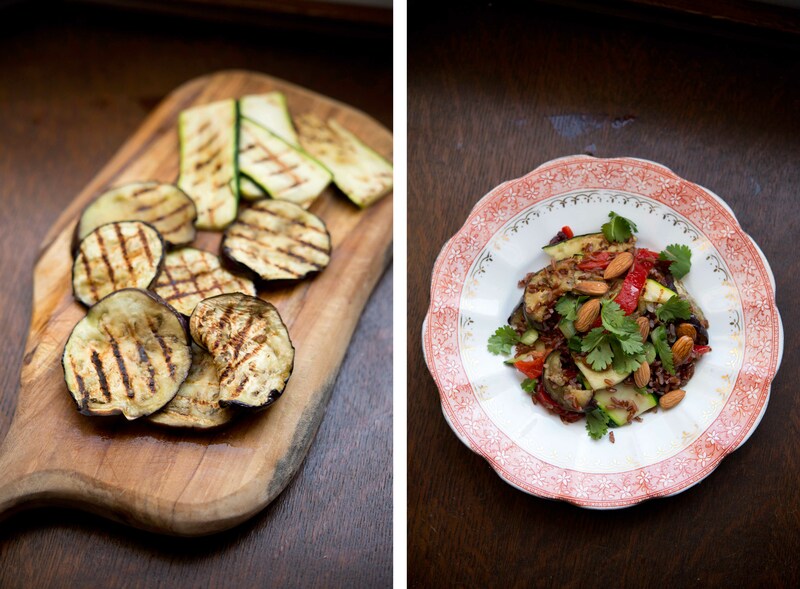 Ottolenghi provides an unstoppable font of inspiration for me. He combines ingredients in ways that I had never even considered (leeks, goats cheese and sultanas, for example) opening up a whole range of new tastes. Also, the methods and techniques of cooking he uses are so varied and interesting that they have me running straight into the kitchen to start experimenting. 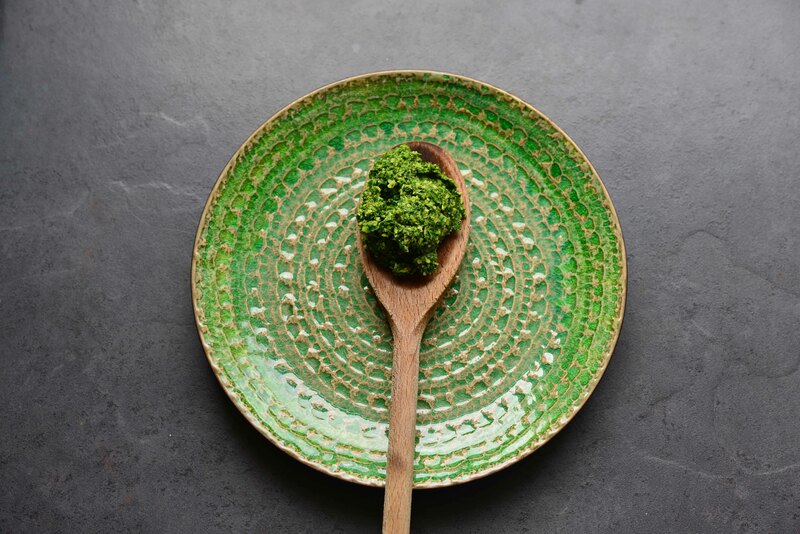 There’s usually one element of each of his recipes that elevates them to another level – such the addition of a particular spice, usually an unpronounceable Middle Eastern variety that can only be ordered online. 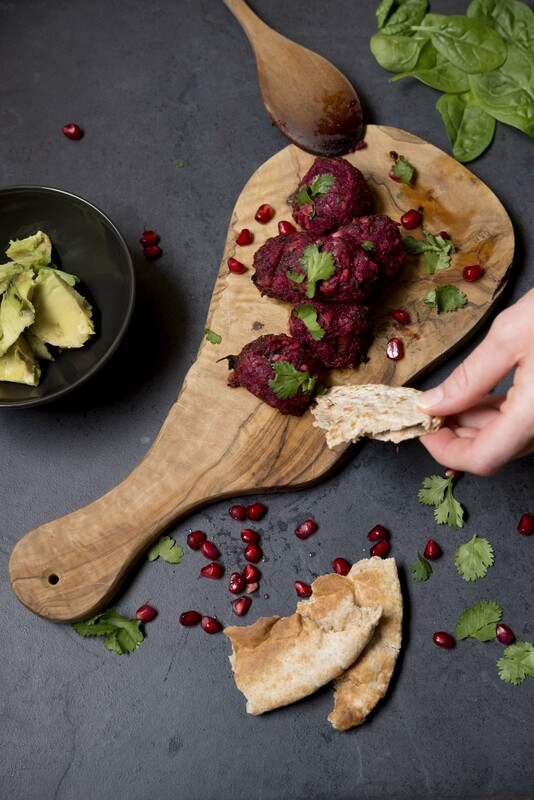 I have invested in several Ottolenghi ‘essentials’, such as pomegranate molasses, sumac and za’tar, but don’t ask me what any of them actually are. All I know is that they often provide an elusive final taste to make Middle Eastern specialities taste much more authentic. 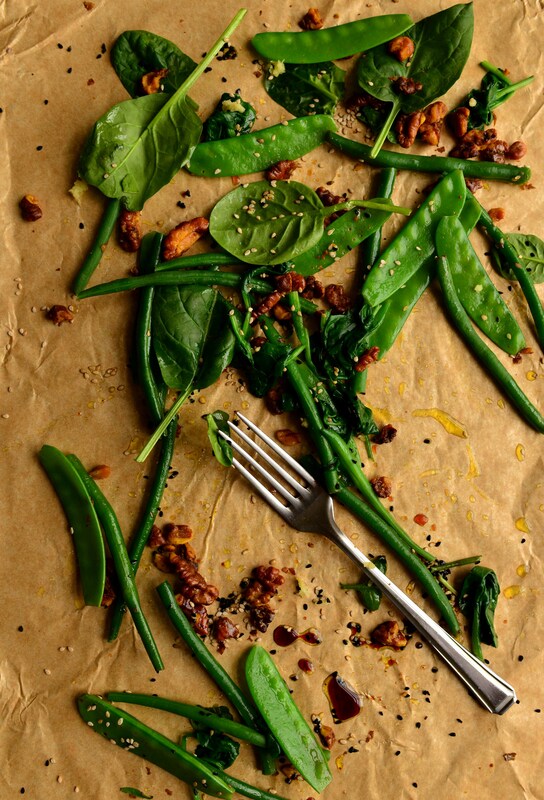 The tumeric roasted walnuts in this recipe are an example of the above – a simple ingredient transformed by the addition of a few spices and a different way of cooking. 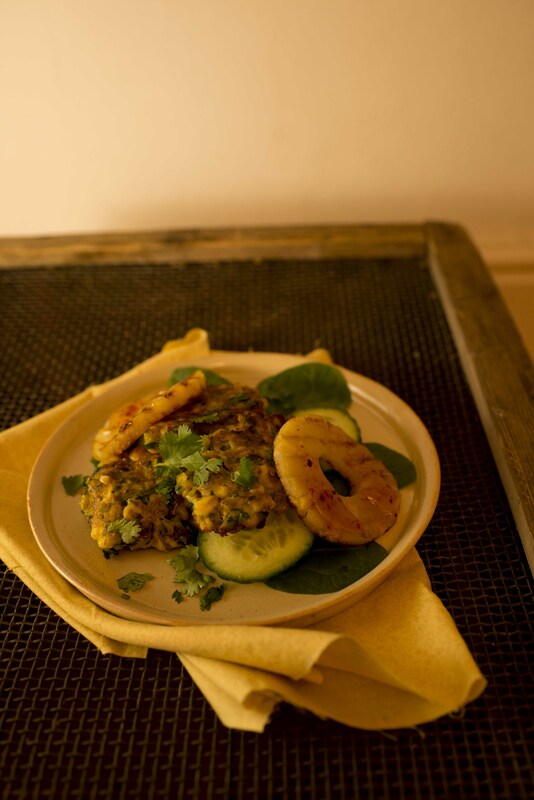 I’ve always considered turmeric a bit of a non-spice, its chief use being the vibrant yellow colour that it imparts. 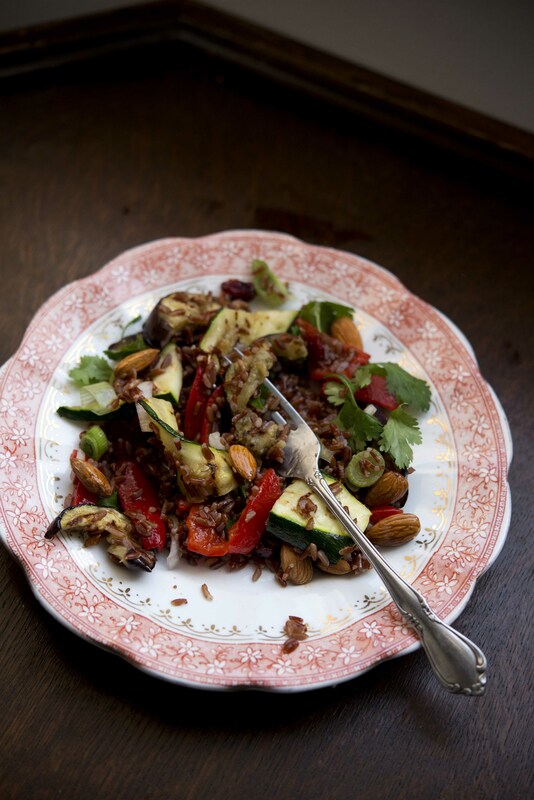 However, roasting walnuts in the spice brings out their sweetness, adding a remarkable depth of flavour. I have since learnt that turmeric is commonly used in sweet dishes, and some folk swear by drinking turmeric tea first thing in the morning. 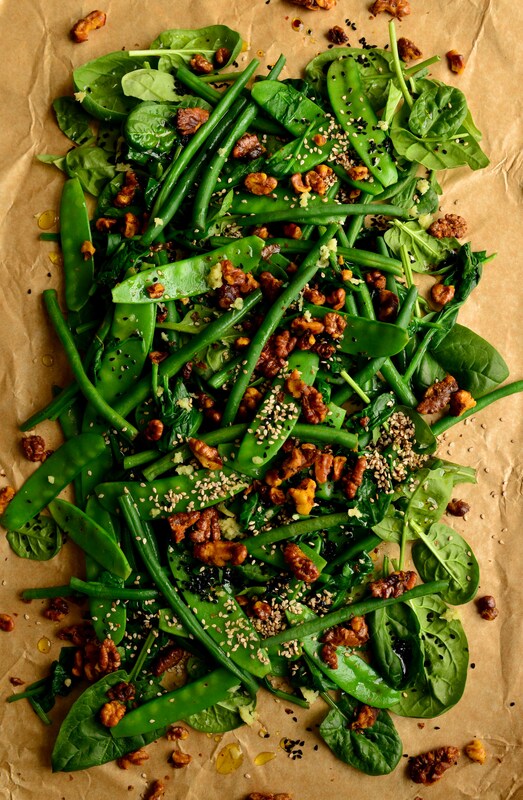 This somewhat fusion recipe combines these walnuts with fresh green veg, sesame seeds and a punchy, vinegary dressing. Hopefully Yotam would approve. I’ve recently returned to Bristol after a restorative and relaxing break visiting my parents in the countryside of Devon and Cornwall. The silence and peace that being a good twenty minutes from the nearest major road affords was much needed. It was lovely to spend time with family, and in my mind, there is too much talk of Christmas being about stuff, rather than people. That being said, carefully chosen presents are always appreciated. My stocking seemed to mostly contain food and food related items, including, of all things, smoked garlic. It was heavily wrapped in newspaper, so as to stop the pungent aroma permeating everything around it. I’m sure this is the modern, Ottolenghi version of a satsuma. Another memorable part of my Chirstmas was visiting my uncle and his family on Boxing Day. We turned up at 5pm, at which point there had been a good three hours of alcohol consumption already. My Mum and I proceeded to neck back the Prosecco at quite a rate, in a feeble (and futile) effort to catch up. When the general level of inebriation reached its peak, there was a particularly hilarious incident that stemmed from the suggestion of karaoke. It was then decided that we didn’t have a microphone, and so must find the requisite stand-in. This led to my uncle foraging through the salad drawer of the fridge to find suitable phallic-shaped vegetables to use as microphones. This included a parsnip, a carrot, a courgette, and, in a moment of desperation, a Romaine lettuce leaf. These were laid out on a tray for the unwitting karaoke performers to make their selection from. There was “Rocking around the Christmas tree” sung into a parsnip, and my personal favourite, ‘Rudolph the Red-nosed Reindeer” with the help of a long red pepper. Lots of food writers talk about how food can evoke memories. Diana Henry, for example, enthuses about how gooey cow’s milk cheeses take her back to snowy seasons in the Swiss Alps, scraping the cheese off slates with spoons whilst sitting by a roaring fire. The connection between the vegetable karaoke and this soup is slightly more tenuous, but I still had to suppress a chuckle as I was peeling the parsnips. 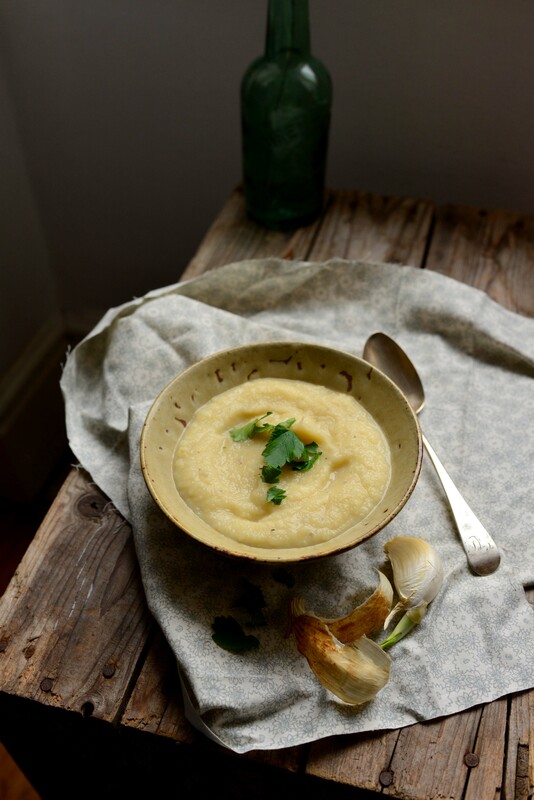 The creaminess of the parsnips works well with the pungent hit of smoked garlic. 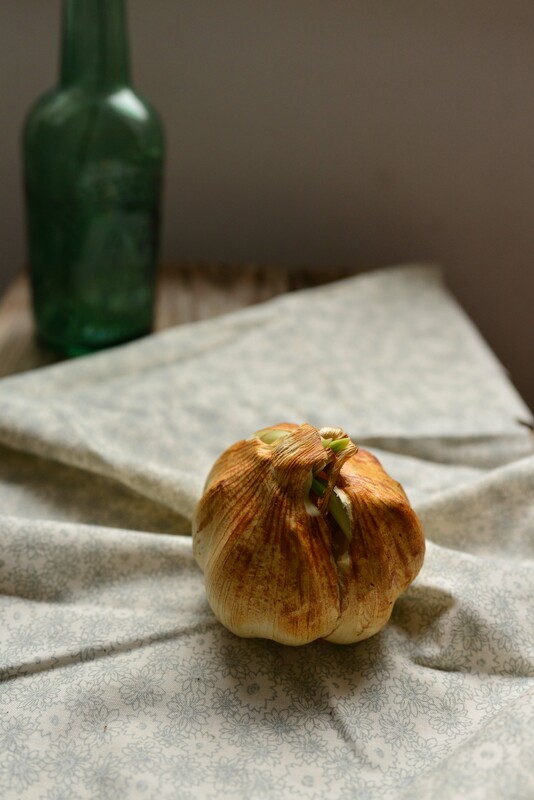 If you can’t get smoked garlic (find your nearest fancy deli and it should have it), just use regular garlic. I think this recipe sums up my Christmas break rather well: wonderfully foodie stocking presents and parsnip microphones. One of the many good things about this collaboration is working with someone who knows the perils of trying to fit a food blog around a full time job. I’ve been doing lots of food photography for my new job (more on that in a later post), meaning that I’m finding it difficult to summon the energy to also do it in my spare time. Paris and I decided to fit in our next Vegessential session one evening after work. We were both knackered, and were seriously contemplating not bothering, but we ploughed on. It was then that we realised that there being two of us makes the whole process much easier. One of the many up-sides of doing a post together is you’ve got someone to help you make all the decisions. It made me realise the sheer amount of decisions involved – about ingredients, quantities, cooking methods, camera angles and styling. It’s great to have someone to offer their opinion on the exact placement of a piece of torn pitta, or an errant pomegranate seed. In fact, we spent the majority of the time precisely arranging the pomegranate seeds to look artfully scattered. 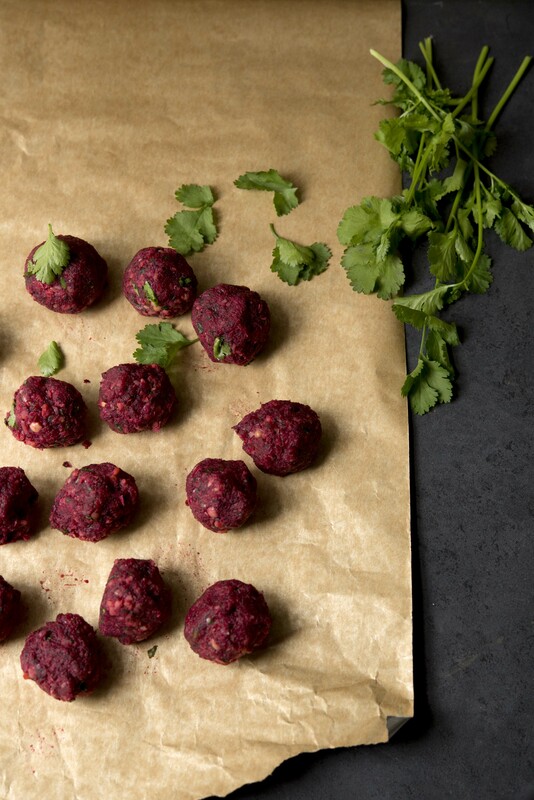 Armed with our trusty beetroot once again, we set about making beetroot falafel. I’ve never had this before, but Paris has, and assured me that it’s delicious. It was. Basically, you just whack everything in a food processor and whizz briefly until it comes together, then roll into balls and fry. We seriously contemplated leaving them raw, as we had to restrain ourselves from eating all of the mix before it was fried. But in the end went for a shallow fry in sunflower oil, until the outside edges began to crisp up. 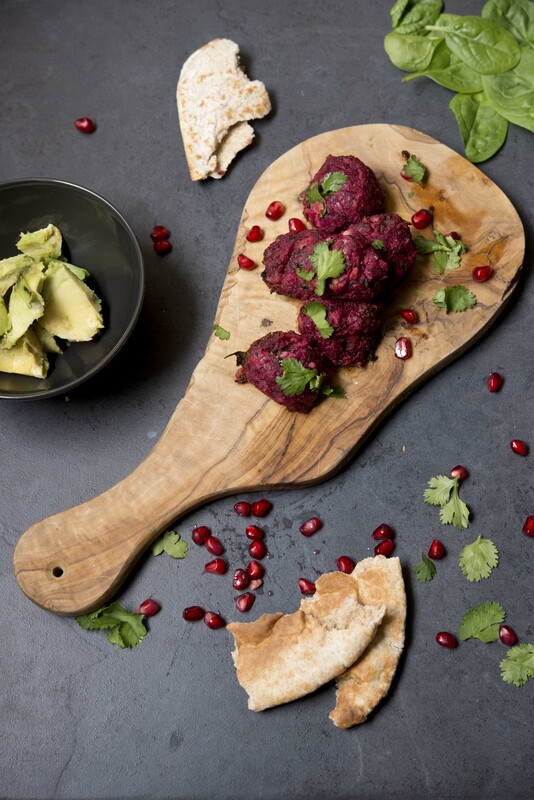 The real winning ingredient was the dates, giving the falafel a sweetness that complemented the beetroot really well. Have a look at Paris’ post on Avocado Please here.